Pedestrians tread carefully on temporary scaffolding that keeps them above flooded NW Hoyt Street at 10th Avenue. The water is due to the Spring flood of 1948; it’s not much more than curb deep here but it’s a long way from the river. Most of the right side of the street is still intact today while the left side has all been replaced. 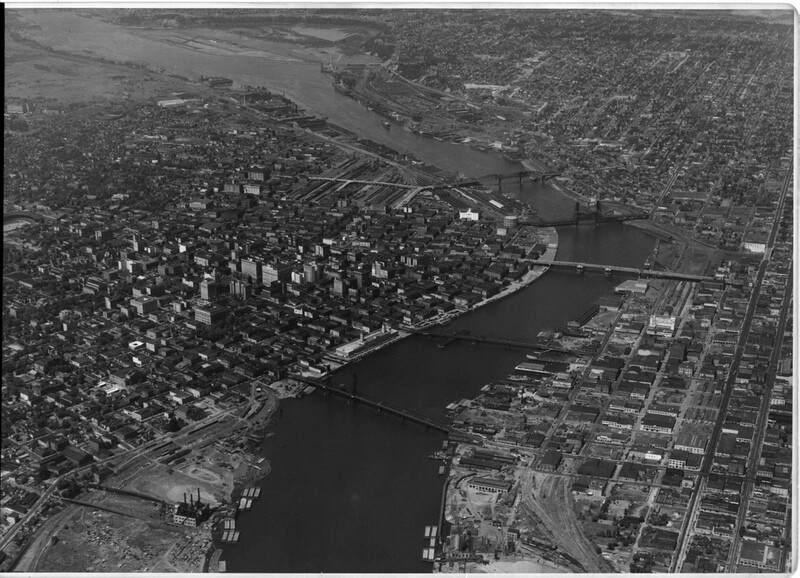 This 1938 aerial view gives us a distant overview of several images we discussed earlier this week. It’s also a good comparison with a photo with the same approximate perspective from 10 years earlier. 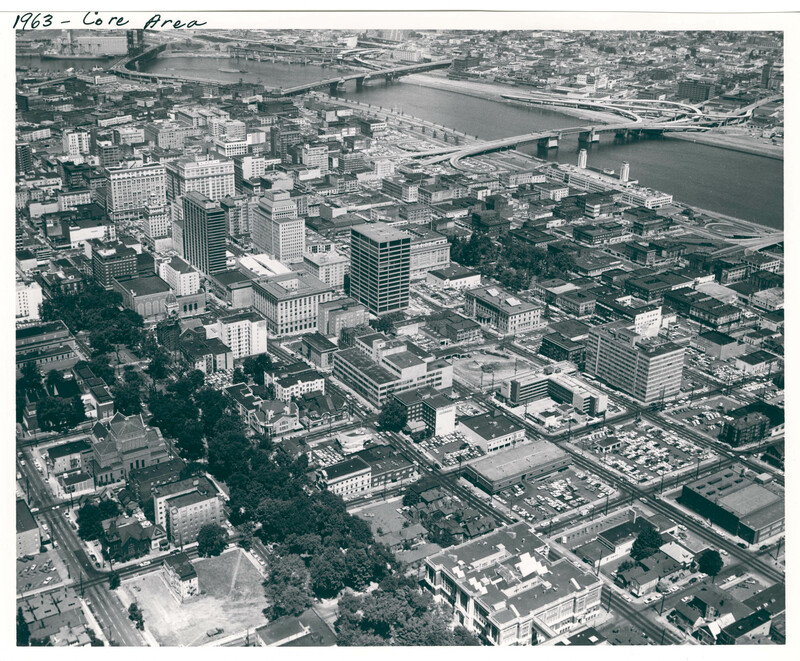 This 1963 aerial photo of the downtown core area shows quite a few buildings we’ve spotlighted here on Vintage Portland. Madison Park Apartments, Ahavai Sholom Synagogue, Cole McElroy’s Spanish Ball Room, the view from City Hall, and Victorian homes along SW Broadway are but just a few. One intriguing remnant is in the lower left corner, the building on SW Clay between SW Park and 10th, the only building remaining on the block. Any idea what that was? 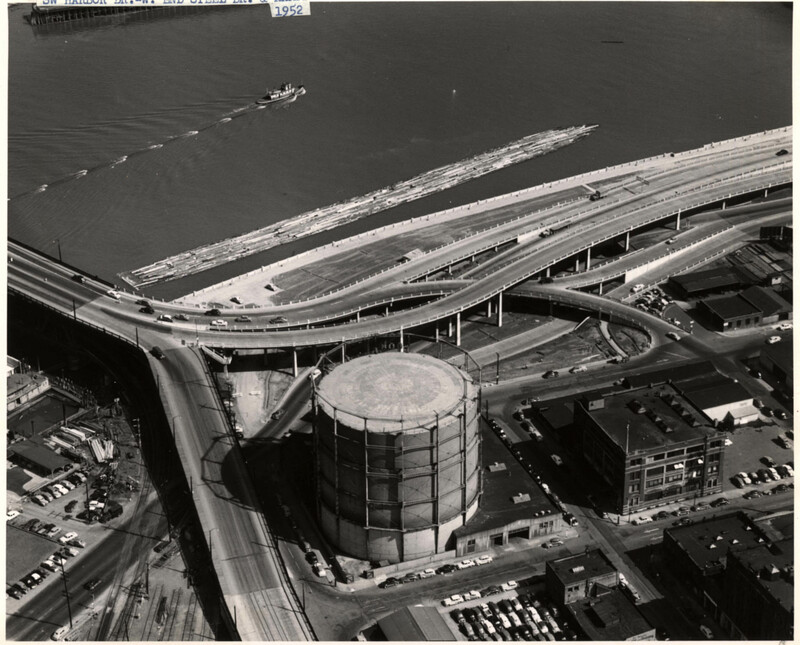 The complex series of Steel Bridge ramps leading to and from Harbor Drive and NW Glisan Street is clearly illustrated in this 1952 aerial photo. The coal gas storage tank is long gone, along with every other building you see here. The Portland Classical Chinese Garden is on the block in the extreme lower right corner. 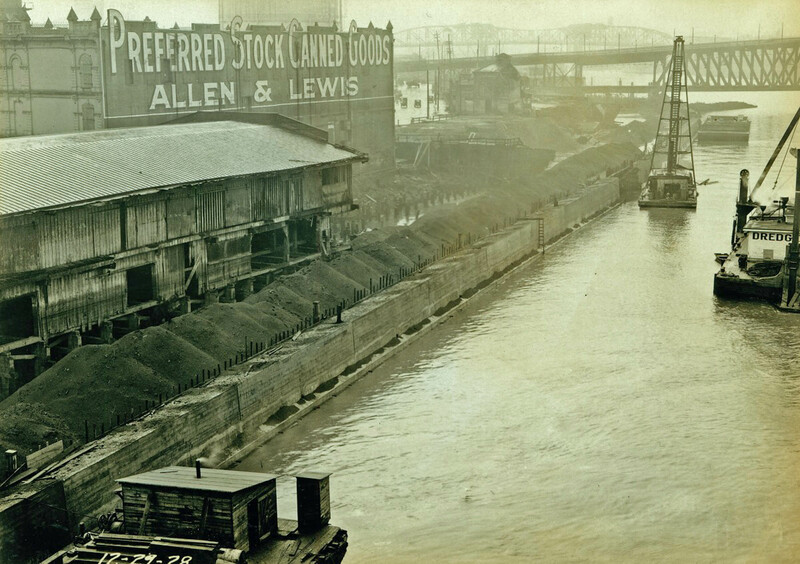 This 1928 image shows the west side seawall construction from the Burnside Bridge. The back of the 1882 iron-fronted Allen & Lewis building facing Front Street between Couch and Davis is shown on the left. The front of this building would have faced the Zeta Psi building from last week. The Steel and Broadway bridges can be seen in the distance. 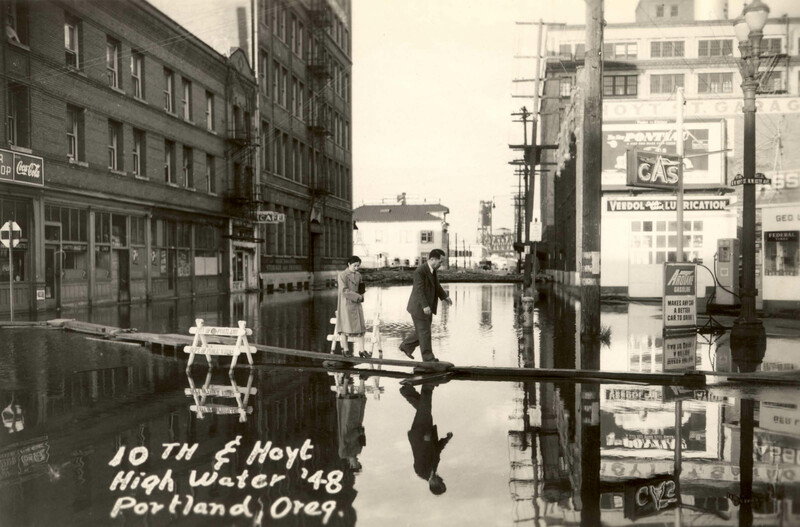 Vanport City wasn’t the only flood worry in 1948 (see yesterday’s post). 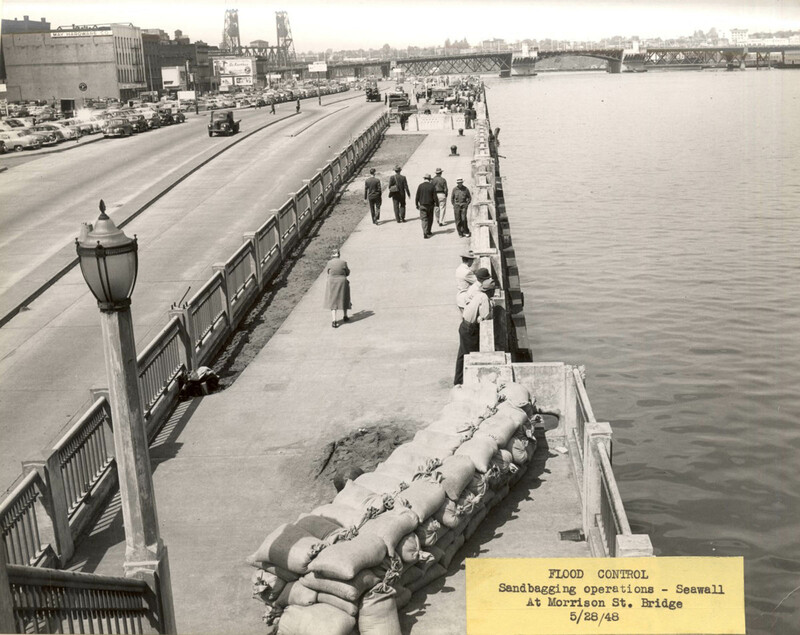 City crews seen here were busy sandbagging along Portland’s west side sea wall two days before the Vanport disaster. Downtown was spared but some areas on both sides of the river weren’t so lucky. Here’s what it looked like a little downriver at the Broadway Bridge.